Status: Paired with Gibble (2012 female) 2016: Made one nesting attempt 2 eggs, both hatched, one chick fledged. : 2017: Made one nesting attempt 2 eggs, both hatched but chicks lost 2018: Made one nesting attempt 2 eggs, both hatched but chicks lost. May 2011: Lofty was the first egg of the first batch of 2011 eggs to hatch and was fighting his way out of the egg during the journey! Lofty is currently one of the biggest of the birds and is the sibling of Wally. June 2011: Lofty is the most dominant of all the cranes, and is quite chilled out until another crane wants to fight with him. Albert tried it on recently.....and lost. August 2011: Lofty has started to bond with his sibling Wally and also with Albert. These three can be seen hanging about together quite a lot and we think they may explore together once they are fully released. October 2011: Lofty is very much part of the large stable flock comprising last and this year’s birds that has slowly and sometimes painfully developed over the month or so since release. September 2012: Lofty has adapted well to life with the Somerset flock and he and his cohort are all behaving as naturally as any wild cranes. They have spent the summer feeding on the un-seasonally flooded grasslands of the Moors and Levels in small fragmented groups, but as autumn rolls in they are starting to flock again and follow the harvest, hoovering up any spilt and wasted grain in farmer's fields. January 2014: 2013 was largely uneventful for Lofty, spending the spring and summer on Aller Moor and West Sedgemoor, although he broke out of his comfort zone in October/November, flying up to Slimbridge along with a group of birds and remaining there for 22 days. The winter was then spent very much as part of a tight-knit flock on Stanmoor, near Stoke-St.Gregory. We hope that he will pair up this year, as he is quite a fine and dominant male bird. August 2014: At the start of the spring, Lofty appeared to be paired up with Gemma, and was observed displaying and mating in late February. However - it was short-lived relationship, and by late March they were no longer together. He was seen in late March displaying with Beatrice - but this also didn't develop into anything. He had a bit of an explore in April -and was one of the birds seen over a few weeks at Goldcliff Lagoons on the other side of the River Severn, near Newport. We are pretty certain that Lofty returned to Somerset to moult and he was seen flying, post moult in early July on West Sedgemoor. July 2015: Lofty spent the winter of 2014/15 on the Somerset Levels and Moors as part of a large flock. In early spring he was seen to be paired up with Gibble (a 2012 female) and was seen around the Newport Wetlands area at various points throughout the spring and early summer. He is not known to have made a breeding attempt there with Gibble but the pair did go ‘off the radar’ for a month and half in the middle of the breeding season, but were seen chick-less in late May and early June. February 2016: Lofty remained in Somerset through the winter of 2015/16. July 16: Seen behaving as a pair with Gibble from January. Possibly at Slimbridge with Gibble in March but not seen after that. Initially he was assumed to be one of the pair observed to be nesting near Newport on the Gwent Levels, South Wales. 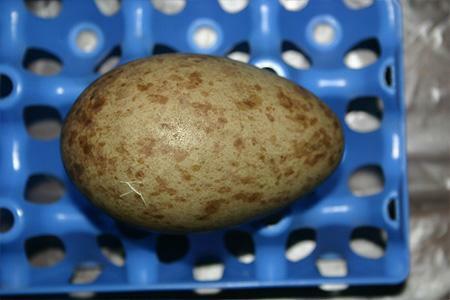 Incubation is thought to have started in early April and hatching around 9th of May. 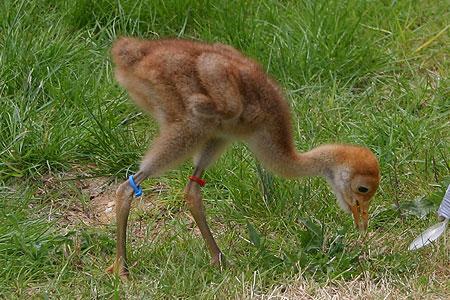 Two chicks were seen hatched, but by late June only one was present. Lofty was seen with Gibble and the chick in July, which is due to fledge at the end of July. Aug 16: Update! Single chick fledged - a first for Wales, well done Lofty! Nov 17: Seen behaving as a pair in Somerset during the winter months . On 12th March two cranes were reported to be back on the Gwent Levels and identified later as Lofty & Gibble. On the 3rd April Gibble was observed incubating and on 1st May the pair were reported as having hatched 2 chicks. The two chicks were still present on 30th May. A month later on 30th June there the adult pair were flying around alone, without their chicks. The cause of the loss is unknown. Lofty and partner returned to the flock in September. Sept18: Reported with Gibble back in S Wales nest site 22nd March. Incubation started on 4th/5th April. Hatch reported to have occurred around 2nd of May. On 25th May reported that the pair were seen without chicks – cause unknown. Gibble seen with an unringed bird in August - possibly their three year old juvenile. Lofty has not been seen since late summer.